Hi All, first of all “A very Happy New Year” to every one. Today we are doing to an awesome tool “Apache Drill” which is made to query any NoSql Database if the form of tables even though the tables does not exist. With ‘Drill’ we can start querying any non relational database just like relational database. Apache Drill supports almost all NoSql databases and filesystems like HBase, Hadoop File System, MongoDB, Hive, MapR-DB and Amazon-S3 and many more. We start trating our JSON data just like table data event when its not. Now let us see how to install Apache Drill on you local machine and how to configure it with MongoDB. once downloaded and installed both of the software, we shall start Apache Drill first. your Apache drill should start with out any errors as shown below. once the Apache drill server is up and running then start the Web Console by hitting the following url. once you have the web console ready, please go to storage menu and enable mongodb plugin by putting the following content. ensure your mongodb server is up and running before this step is done. once done we can start querying the mongodb same as relational database as shown below. The same results in mongodb client shell as shown below. Thats all folks, you have successfully configured Apache Drill with mongoDB. in my next post will be integrating Apache drill to Java and query MongoDB. Hi all from past few weeks i was doing research on NoSql, so in the research i found that NoSql has been categorized into three types “Document Database”,”Column Database”,”Graph Based Database”. I have chose two database to integrate with spring one is MongoDB(Document based database) and the other is Apache Cassandra (Column Family Database). 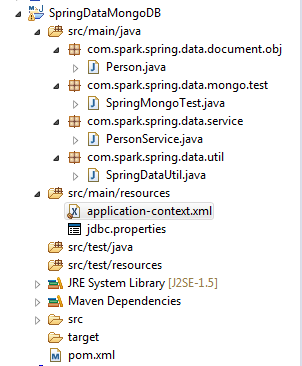 In this post i am going to explain how to integrate MongoDB with Spring. In later posts i will explain how to integrate Spring with Cassandra. Note : before start reading this post please install MongoDB, based on your OS compatibility. Let us talk about mongodb a little bit before we dive into the tutorial. MongoDB is cross-platform document oriented database that provide high reliability and scalability, this works on concepts of documents and collections. A document is a set of key-value pairs. Documents have dynamic schema. Dynamic schema means that documents in the same collection do not need to have the same set of fields or structure, and common fields in a collection’s documents may hold different types of data. A collection is set of documents, this collection can exist in single or multi-node cluster database. A document with in a collection can have different fields. let us see the pom.xml configuration. This project is compatible with java 8 specification. Now let us look at the Utility class that will help us to load the configuration file and fetch the different bean objects. Let us create the domain objects in order to hold the data and these are the objects that gets persisted as documents inside mongodb. Once the document objects are ready in hand let us start writing the service implementation. Please observe service class the MongoTemplate (Similar to JdbcTemplate) of SpringFramework gets injected as constructor argument and this is responsible of doing different operations on database. Once the service class is ready in hand it’s time for us to test this class, before running the test class make sure your mongodb is up and running. if every thing goes well and good then we should see some thing as below as output in mongo database. MongoDB is a document database that provides high performance, high availability, and easy scalability. Documents (objects) map nicely to programming language data types. Embedded documents and arrays reduce need for joins. Dynamic schema makes polymorphism easier. Embedding makes reads and writes fast. Indexes can include keys from embedded documents and arrays. Optional streaming writes (no acknowledgments). Replicated servers with automatic master failover. Automatic sharding distributes collection data across machines. Eventually-consistent reads can be distributed over replicated servers. With MongoDB Management Service (MMS) MongoDB supports a complete backup solution and full deployment monitoring. A MongoDB deployment hosts a number of databases. A database holds a set of collections. A collection holds a set of documents. A document is a set of key-value pairs. Documents have dynamic schema. Dynamic schema means that documents in the same collection do not need to have the same set of fields or structure, and common fields in a collection’s documents may hold different types of data. Now lets code our Service class that will interact with MongoDB using SpringFrame work class MongoTemplate. as shown below. 2. using the Criteria class and specifying the criteria. 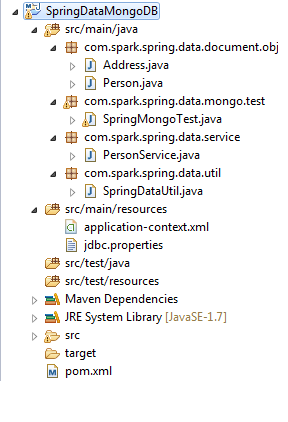 Both these class are implemeted in SpringData framework. Now lets take look at application-context.xml file as below. uncomment to check different methods in above code. finally our POM.xml is as follows. finally the project structure should look as below. Note:jdbc.properties in the image shown is not needed.